Give your child the gift of non-stop fun with an extra Peg-Perego rechargeable battery! Kids want to keep riding their Peg-Perego battery-powered ride-ons. So when they’ve used up all the charge, switch that battery out with this extra Peg Perego 6 Volt Battery, fully charged, and away they go! 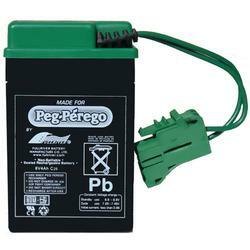 This battery's voltage and amperage is designed to make it compatible with ALL 6 Volt Peg Perego vehicles. It also serves as a replacement for the older IAKB0500 model. Rechargeable battery, tested for “cycle life"